Mr. Beslow received a B.A. Degree in Government from Hamilton College and a J.D. from Indiana University. He is licensed to practice law in New Jersey and New York, the U.S. District Court of New Jersey and the Southern and Eastern Districts of New York. Prior to joining Mark Goldman, P.C., Mr. Beslow was an associate with Raymond and Raymond in East Orange, New Jersey. In this position, Mr. Beslow has successfully represented debtors in all types of consumer bankruptcy cases. Mr. Beslow previously worked for Fein, Such, Kahn and Shepard, P.C., in Parsippany, New Jersey. He represented major mortgage companies and financial institutions in bankruptcy and foreclosure matters. Mr. Beslow is a member of the National Association of Consumer Bankruptcy Attorneys, as well as the New Jersey State Bar Association. He will be participating in the Bankruptcy Inn of Court. He is a participant on a bankruptcy panel at an upcoming Institute for Continuing Legal Education seminar this December. In his spare time, Mr. Beslow volunteers as the attorney coach for the Ramsey High School Mock Trial Team. 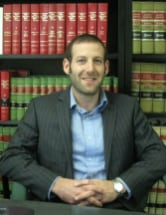 He has been a panelist on a bankruptcy panel for New Jersey Institute for Continuing Legal Education. In his spare time, Mr. Beslow volunteers as the coach for the Ramsey High School Moot Court Team. Fein, Such, Kahn and Shepard, P.C.